With this collection of science kits, you and your students can explore the concepts behind and the many applications of solar hydrogen, direct methanol, and other fuel cell technologies. The Solar Hydrogen Kit contains over 20 different experiments that explore this emerging technology using the same techniques employed in advanced industrial applications. 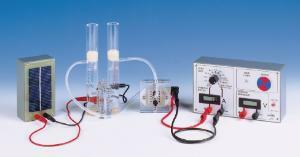 The Direct Methanol Fuel Cell lets students perform a wide range of experiments covering the working principles of the methanol fuel cell and the potential uses of this amazing energy source. 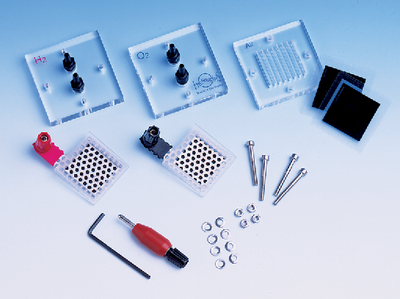 The Dissectible Fuel Cell expands the Hydrogen Science Kit, allowing for more experiments and an in-depth examination of the principles and process parameters of fuel cells. The Hydrogen Fuel Cell Model Car is for those who want to demonstrate a driving fuel cell car. THe kit includes a solar module to power the reversible fuel cell for charging-up the car with hydrogen and all necessary cables. 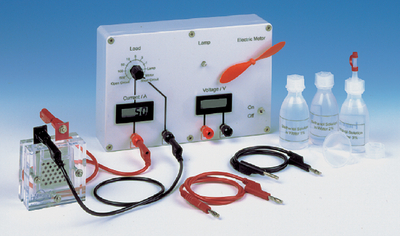 The kit with four manuals includes: PEM fuel cell, PEM-electrolyser (1W) with gas-storage cylinders, solar module, load measurement box, stop watch, connecting cable and silicone tubes, tubing stoppers, replacement bulb, and instruction booklet. Direct Methanol Fuel Cell includes methanol fuel cell with tank, load measurement box, 3 methanol bottles, funnel, spout, cables, storage container with lid and instructions.